Preparing to drive again post-WW2. Homepage. This page: Preparing a 1930's car that had been laid up during the Second World War. Re-commissioning a pre-war car in 1946. Due to shortages of fuel and resources, motoring for many people had to be put on hold during WW2, with only those engaged in essential work and services being able to acquire enough to continue regular motoring. Garages up and down the land became long-term homes for countless pre-war motor-cars. Jacked up on blocks, their radiators drained and their bodywork covered in sheets, these cars would remain hidden away until the end of the war in 1945. Slowly but surely, as some semblance of normality came back into the lives of families who'd survived the war, attentions returned to the pre-war cars tucked away in their motor houses. Shortages and fuel rationing would take some years to disappear altogether, but in an attempt to get back to a normal way of life, and enjoy once more the freedom of the road - as fuel supplies allowed - families dusted down their four-wheeled friends, and undertook re-commissioning work on them. Those who weren't too mechanically adept would enlist the services of their local garage, and as such business for many workshops was brisk. 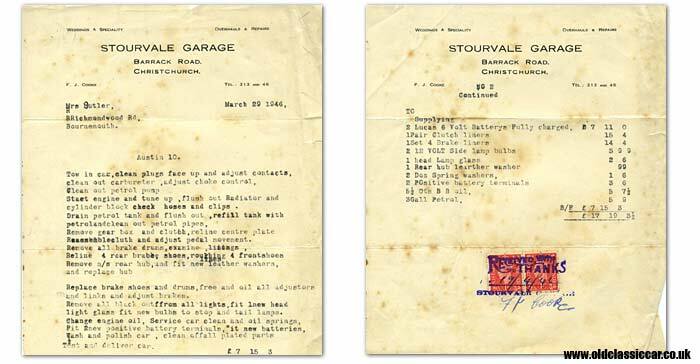 The two-page invoice featured below documents work done by Stourvale Garage, of Barrack Road in Christchurch, to a pre-war Austin 10. Evidently it had been used early in the war, and laid up once shortages began to take a hold. Mrs Butler, of Richmond Wood Road in Bournemouth, enlisted the garage's services in March 1946. Both mechanical and cosmetic work was undertaken on the Austin, to prepare it for use once again, including the removal of black-out masks fitted to the car's lamps. The list of chargeable work is listed below, much of which will be familiar to anyone who has bought an old car and wants to get it running once more. Tow in car, clean plugs, face up and adjust contacts. Clean out carburettor, adjust choke control. Start engine and tune up. Flush out radiator and cylinder block, check hoses and clips. Drain petrol tank and flush out, refill tank with petrol and clean out petrol pipes. Remove gearbox and clutch, re-line centre plate. Re-assemble clutch and adjust pedal movement. Remove all brake drums, examine linings. Re-line 4 rear brakes shoes, roughing 4 front shoes. Remove n/s rear hub, and fit new leather washers, and replace hub. Replace brake shoes and drums, free and oil all adjusters and links and adjust brakes. Remove all black out from all lights, fit new head light glass, fit new bulbs to stop and tail lamps. Service car, clean and oil springs. Fit 2 new positive battery terminals, fit new batteries. Wash and polish car, clean off all plated parts. 2 Lucas 6 volt batteries full charged. 1 set 4 brake liners. 2 12 volt side lamp bulbs. 1 rear hub leather washer. 5.5 Qts B B oil. The invoice was settled on 19th April 1946, signed by the proprietor F.J. Cooke of Stourvale Garage. Whether the car was put straight into use or not I don't know, however in May of 1946 Mr Butler (RAF) put a deposit down on a brand new Austin 10, the invoice for which can be seen here. Perhaps Mrs Butler drove the pre-war Austin, while her husband ran the new car, or vice versa? Do these garage premises still exist on Barrack Road? There are a couple of motor dealers now situated on this road, but unfortunately there is no specific building number for Stourvale Garage mentioned on the invoice, so I can't directly tie-in this old business with modern businesses now in that area. More items of paperwork relating to pre- and post-war cars and garages, can be found in the Motoring Collectables section.